Amy Reeder has been a favorite artist of mine since one of my friends raved about her work. He directed me to read “Madame Xanadu” , which I will be finishing and reviewing later, and I loved it. Reeder’s art here is a continuation of her maturation as an artist. The smooth lines, the retro yet modern designs and her storytelling combine to make a beautiful package. 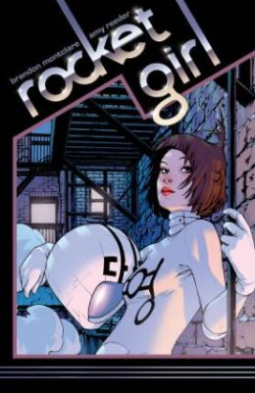 Rocket Girl is a person out of time story with her traveling to the past. I have to say that I was won over as soon as I saw she was wearing a jet pack. Jet packs have been a favorite of mine since the first time I saw Adam Strange and later on when Dave Steven’s unleashed the Rocketeer. You can’t go wrong with a jet pack. The storyline is easy to follow as we see our protagonist try to adapt to a society that is backwards to her. The characters are fleshed out to give the reader the feeling that they already know the people in the story. In some respects I would love to see a movie version of this story but I am afraid it would not live up to the comic.